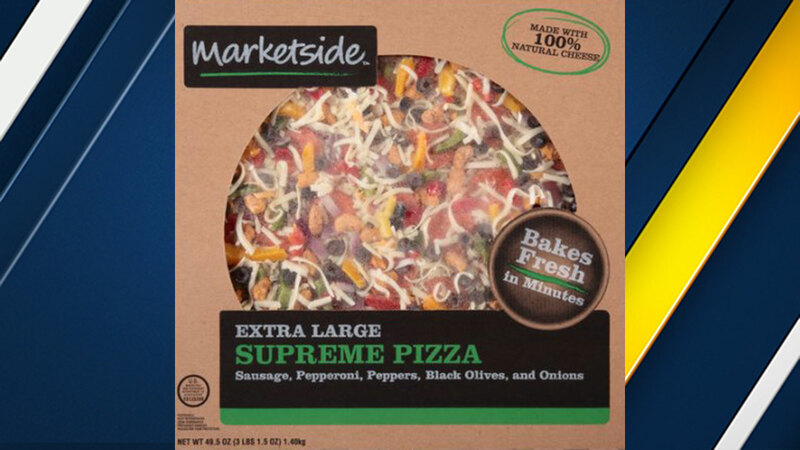 Frozen pizza sold at Walmart labeled "Marketside Extra Large Supreme Pizza" with lot code 20547 is being recalled because of possible Listeria contamination. VERNON, Calif. -- A Vernon company is issuing a recall of 21,000 pounds of frozen pizza sold at Walmart stores because of possible Listeria contamination. The 16-inch pizza made by RBR Meat Co. is sold as "Marketside Extra Large Supreme Pizza" with lot code 20547. Routine testing by the company revealed the presence of Listeria monocytogenes in pizza produced on Feb. 23, 2017, according to the U.S. Department of Agriculture. About 1,600 people are infected with listeriosis every year and of those 260 die, according to the U.S. Centers for Disease Control and Prevention. Symptoms include fever, muscle aches, diarrhea and other gastrointestinal issues. The most vulnerable are pregnant women, newborns, older adults and people with weakened immune systems. The company said there have been no confirmed reports of illness. The pizza is sold at Walmart stores throughout the West Coast. Anyone who purchased the product is urged to throw it away or return it to the place of purchase. More information about the recall is available from the USDA here.